24 புதிய மருத்துவக் கல்லூரிகள், 248 செவிலியர் கல்லூரிகள் தொடங்க மத்திய அமைச்சரவை ஒப்புதல் | Cabinet approves establishment of 24 new medical colleges . 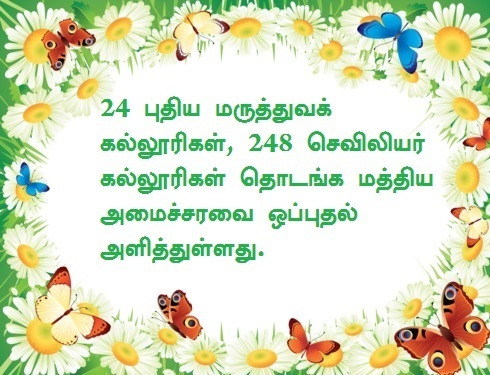 24 புதிய மருத்துவக் கல்லூரிகள், 248 செவிலியர் கல்லூரிகள் தொடங்க மத்திய அமைச்சரவை ஒப்புதல் அளித்துள்ளது. புதிய மருத்துவக் கல்லூரிகள் 18,058 மருத்துவம் மற்றும் முதுநிலை மருத்துவ இடங்கள் நிரப்பப்படும் என்று மத்திய அரசு தெரிவித்துள்ளது.The Union Cabinet today approved schemes worth about Rs 14,930 crore to boost the availability of human resources for health and medical sector, including the establishment of 24 new medical colleges in unreserved areas. Other than the new colleges, 18,058 undergraduate and postgraduate seats will be increased in medical colleges by 2020-21, according to an official statement. The government also plans to set up 248 nursing and midwifery schools. It has been planned to ensure at least one medical college for every 3-5 parliamentary constituencies and at least one government medical colleges in the state. The location of new medical colleges will be selected by the state government within the identified blocks in a "challenge mode", it said. The scheme will serve to create additional 10,000 MBBS and 8,000 PG seats in the country, bridge the gap in number of seats available in government and private sector mitigate the shortage of doctors and medical faculty in India by increasing the number of seats and to achieve the desired doctor- population ratio, upgrade PG teaching facilities in government medical colleges.